The beautiful Sorrowful Mother Shrine in Bellevue, Ohio, is the oldest Marian shrine east of the Mississippi. 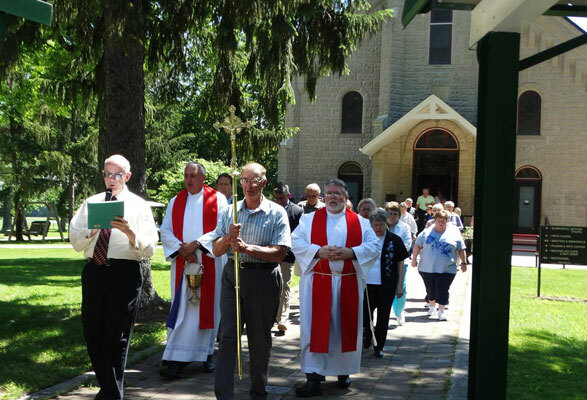 The shrine, located on 120 acres in Ohio’s Seneca County, was established in 1850 by Fr. Francis de Sales Brunner, C.PP.S., who first brought the Missionaries of the Precious Blood to the United States. Fr. Brunner had a great devotion to the Sorrowful Mother, and always asked for her intercession as he guided the Missionaries in their new ministry in the United States. Visitors are always welcome at the shrine, which is beautiful in all seasons. The shrine offers indoor and outdoor chapels, a gift shop and cafeteria. Visitors and pilgrims can also walk and pray along its peaceful wooded pathways. Each year, more than 100,000 pilgrims visit the shrine, many of them during specially scheduled events during the summer months. The shrine is open year-round, and the Missionaries of the Precious Blood offer liturgies, retreats, prayer services, days of reflection and other special events to help enrich the spiritual life of all.